Congratulations to our client, Maurice Tegelaar, of Pacific Union, Sonoma for marketing and selling the most expensive listing to close in 2009 so far in Sonoma County, California! The 3600-square-foot custom home, plus guest house of 720 square feet is located on a knoll in Kenwood with majestic views of the Mayacamas mountains and vineyards. Among the many features of the home is the masterful blending of old-world style and materials with attention to modern “green” construction, rastra block, and photovoltaic cells providing electricity for the home as well as solar panels for domestic hot water use. 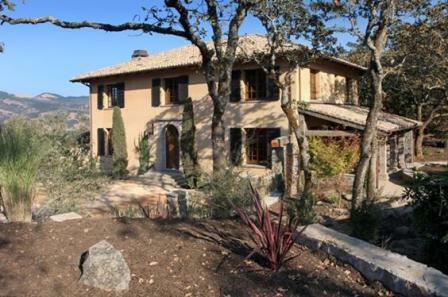 At $3,8M, this was the highest recorded sale in Sonoma County, year to date. Maurice explains “Montevigna is truly one of those exceptional properties that come around every so often. The beauty is in the details that wows visitors. The property site was originally a stone quarry that produced the stone used to build the streets of San Francisco. From the spectacular Sonoma Valley views, to the numerous antique architectural elements from France, Africa, Mexico, Canada and the United States, this home represents a classic amalgamation of historical and high tech elements."